A state capitalist society may sound off-putting but it is the proper term for what we are living through now. Education is an essential component because of the need for a ‘consensus’ ideology among the broad population that comes to see the desired ends and policies of the politically-connected and public sector class as consistent with their own beliefs. Or necessary to avoid economic or environmental disaster. Even if those To-Now-Be-Desired beliefs have had to be heavily propagandized by the schools and the media. That was the spirit of that Dalian, China conference discussed in the last post. It was the underlying mindset of a program I attended last week sponsored by the world’s most famous search engine on “Georgia’s Digital Economy” that probably will have a variant coming to your state. Where access to the sovereign powers is what counts for future prosperity. The last quote above is from the program materials for my next field trip. And the needed radical changes to education, K-12 and higher ed, are essential components of all these pushes. And centralizing control over the messages being delivered via education and making it psychological and visual in focus using gaming and virtual reality is, oh so useful, in perpetuating the needed delusion. The level of interventionism being sought in our society and economy requires comprehensive planning. And that “presupposes complete unity with regard to a scale of priorities” which again implicates schools and the media. I am quoting here from a June 1975 paper called “From Laissez-Faire to Zwangswirtschaft: The Dynamics of Interventionism” by John Hagel, III and Walter Grinder. They say the only way out of this destructive trajectory is for people to come to recognize just how destructive this pathway is. I am doing my best with this blog and particular post to do just that. And that real aim is why fathers in Maryland are being arrested now for trying to speak out against the Common Core at a school board meeting. It’s why high-achieving Fulton County in Georgia needed a conversion charter that actually commits it to gut academics with no effective recourse by parents, taxpayers, or students and why the charter is being touted as a model for other suburban districts. 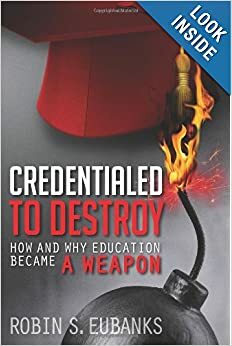 It’s why elected school boards are being increasingly stripped of authority by the accreditation agencies who rarely advertise that they see their positions as using their lucrative government-provided monopoly positions to invisibly advance cultural change towards this very Zwangswirtschaft vision. All of this matters so much because state-directed economies are enormously wasteful in addition to the lack of genuine individual freedom. In a different paper linked to by Rockwell above, they point out that the “political means alone is unproductive and parasitic” and it needs a private sector of labor and exchange to survive but planning and intervention, once started, create dislocations that led to more interventions, which leads to more economic stagnancy and unemployment. Which leads to more political demands to do something. Precisely where the US finds itself in 2013 after that 2008 crony financial bailout and a Stimulus Act in 2009 that could best be described as “friends, family, and large supporters” on who was helped. Not to mention what is going on in healthcare. And now the Common Core and the attendant transformation of higher ed can target students to create the desired consensus and ideology and Worldviews. Remember UNESCO has said this is precisely what they are doing now globally via education and the sought complicity of the media. http://www.invisibleserfscollar.com/decreeing-the-interdependence-of-environment-economy-society-and-cultural-diversity-in-the-21st/ was that revelatory post. I have to get ready to take good notes at another confab of what is being billed as “the elite” assembling to learn why and how to push this vision. With no mention so far of the attached poison that comes with it. The term in the title “agents of ideological hegemony” is the precise term used repeatedly of what it takes to get this vision in place and I will be listening to see whether I am hearing from a knowing, duplicitous agent or a naive, inadvertent one. I strongly suggest using the same tactic whenever you hear a pitch for the Common Core or PISA or 21st Century Learning and other education reforms. It really does describe what Marina Gorbis is actually up to in education or Peter Senge. And so many others who are being marketed by school districts and politicians as authorities to trust and defer to. Remember always where this vehicle intends to go. And that economic stagnancy or collapse is the inevitable result, whatever the PR hype.